Ukraine summons Israeli ambassador for reprimand after Netanyahu cancels visit of Ukrainian PM following anti-Israel UN resolution. 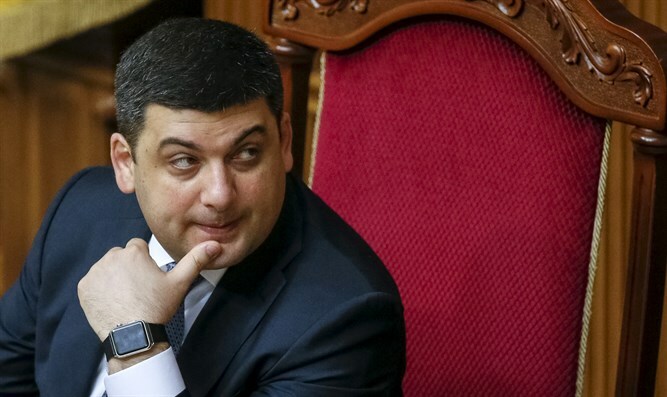 Israel's Ambassador to Ukraine, Eli Belotserkovsky, was summoned to the Foreign Ministry in Kiev following Israel's decision to cancel the visit of Ukrainian Prime Minister Volodymyr Groysman to Israel. Prime Minister Binyamin Netanyahu made the decision to cancel the visit of his counterpart as part of his policy of showing the nations which voted for the anti-Israel resolution at the UN Security Council last week that there will be consequences for voting against Israel at international forums. The Ukrainian Foreign Ministry summoned Belotserkovsky to reprimand him for Netayahu's decision to cancel the visit. However, the conversation turned warm and friendly. "We’re confirming that our ambassador Eli Belotsercovsky was summoned to the Foreign Ministry in Kiev for a meeting following Israel’s decision regarding the visit of Ukraine’s prime minister,” IsraeIi Foreign Ministry spokesperson Emmanuel Nahshon said. Ukrainian officials expressed surprise at the Israeli response to its vote in favor of the UN resolution and expressed hope that the vote would not affect Ukrainian-Israeli ties.